Bold Festive Badge. 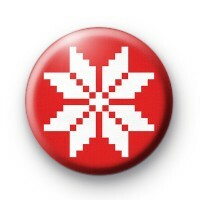 This bright red Christmas badge has a Scandi style white snowflake in the centre. It is a fun yet simple Xmas badge and one that would look super festive pinned to your coat or work uniform. We have lots of colourful snowflake badges in the shop, so if you need more designs then make sure you take a look at those too. We have hundreds of Christmas badges to choose from and all of our badges are made in Great Britain. Standard 25mm Xmas badge.